MWC 2018: ARCHOS launches world's first Android electric scooter, the ARCHOS Citee Connect. ARCHOS today announced the launch of Citee Connect, the first Google Android scooter, fully imagined, prototyped and assembled in France and also previewed the ARCHOS Citee and ARCHOS Citee Power scooters. The ARCHOS Citee Connect is the first Google Android scooter. With its multimedia dashboard, it comes in a large high definition screen, with a touch panel, embedding all the functions of a smartphone. Powered by a quad-core processor, 1 GB of RAM and 8 GB of flash memory, and Google Android 8 ("Oreo"), this 5-inch display is protected against shocks and bad weather. It not only shows speed but also distance traveled and remaining battery level. It is connected in 3G, allowing the driver to access numerous applications and services during journeys. The ARCHOS Citee Connect is equipped with ergonomic handles and large wheels (8.5 inches), puncture-proof and dimpled for better suspension. Its 250W motor and 36V battery give it a range of over 25 kilometers in urban areas. The battery life can be increased by 15% thanks to its energy recovery system, which automatically recharges the battery with each braking. It can also be charged via a docking station, very conveniently, available as an option. Equipped with a reel lock, integrated into the chassis and controlled by an application installed on the dashboard, the ARCHOS Citee Connect can be parked safely anywhere around town. It is easily shared remotely via a dedicated application hosted on a smartphone. 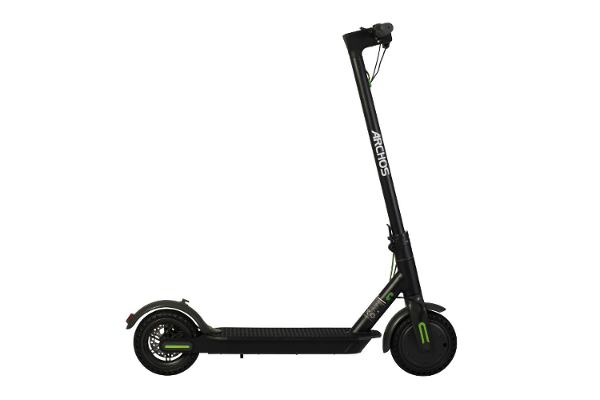 The electric scooter ARCHOS Citee is made of aluminum, for a maximum of lightness and resistance. It is equipped with large wheels for more comfort on the tracks. Easy to drive with its three speeds, it can reach a maximum speed of 22 to 25 km / h. It offers an excellent level of safety, with its rear brake and reflective strips on the sides. Its acceleration and deceleration can be adjusted from the handlebars. It folds in the blink of an eye, safely, thanks to a dedicated latch, and weighs less than 12 kgs. Its display shows the speed and remaining level of the battery. It can support up to 100 kgs. The electric scooter ARCHOS Citee Power can follow all types of lanes, including the steepest, with its large 8.5 inch wheels. It provides maximum adequacy to traffic conditions and comfort with its two speed levels, slow or fast. Truly adapted to roads, it reaches a maximum speed of 25 km / h for a range of 18 to 22 kms. Ultra-secured, it is equipped with disc brakes, a non-slip coating, a headlight, a light that signals the braking in the back and a bell, convenient to warn its presence. Resistant, with a high-quality aluminum frame, it folds easily and is carried everywhere with its hook attachment. Its LED display shows the speed and remaining battery level. Sneak previewed at the MWC 2018 (Hall 6 - Stand B60), the scooters ARCHOS Citee and ARCHOS Citee Power will be available in April 2018 starting from 399,99 €. The ARCHOS Citee Connect is expected to hit the shelves in summer 2018 at 499.99 €.